The Clostridia are a highly polyphyletic class of Firmicutes, including Clostridium and other similar genera. They are distinguished from the Bacilli by lacking aerobic respiration. They are obligate anaerobes and oxygen is toxic to them. 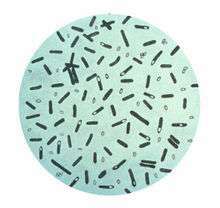 Species of the genus Clostridium are often but not always Gram-positive (see Halanaerobium hydrogenoformans) and have the ability to form spores. Studies show they are not a monophyletic group, and their relationships are not entirely certain. Currently, most are placed in a single order called Clostridiales, but this is not a natural group and is likely to be redefined in the future. Most species of the genus Clostridium are saprophytic organisms found in many places in the environment, most notably the soil. However, the genus does contain some human pathogens (outlined below). The toxins produced by certain members of the Clostridium genus are among the most dangerous known. Examples are tetanus toxin (known as tetanospasmin) produced by C. tetani and botulinum toxin produced by C. botulinum. Some species have been isolated from women with bacterial vaginosis. Heliobacteria and Christensenella are also members of the class Clostridia. Some of the enzymes produced by this group are used in bioremediation. Since they are commonly found in soils and in microbial flora of humans and animals, Clostridia wounds and infections are found worldwide. Host defenses against the microbe are nearly absent, and very little innate immunity exists, if any. Clostridia can be diagnosed by recognizing the characteristics of the lesion of the infection along with Gram stains of the tissue and bacterial culture. Although the body does not have adequate defenses alone, this microbe can be controlled with the help of antibiotics, like penicillin, and tissue debridement for the more severe cases. The currently accepted taxonomy is based on the List of Prokaryotic names with Standing in Nomenclature (LPSN) and National Center for Biotechnology Information (NCBI) and the phylogeny is based on 16S rRNA-based LTP release 106 by The All-Species Living Tree Project. ↑ Africa, Charlene; Nel, Janske; Stemmet, Megan (2014). "Anaerobes and Bacterial Vaginosis in Pregnancy: Virulence Factors Contributing to Vaginal Colonisation". International Journal of Environmental Research and Public Health. 11 (7): 6979–7000. doi:10.3390/ijerph110706979. ISSN 1660-4601. PMC 4113856 . PMID 25014248. ↑ J.P. Euzéby. "Clostridia". List of Prokaryotic names with Standing in Nomenclature (LPSN). Retrieved 2011-11-17. ↑ Sayers; et al. "Clostridia". National Center for Biotechnology Information (NCBI) taxonomy database. Retrieved 2011-06-05. ↑ All-Species Living Tree Project. "16S rRNA-based LTP release 106 (full tree)" (PDF). Silva Comprehensive Ribosomal RNA Database. Retrieved 2011-11-17.